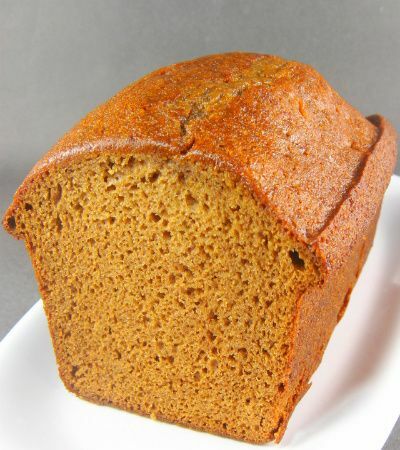 From the kitchen of One Perfect Bite...Pom Koec is a Belgian coffee cake that is similar to, but a bit drier than the honey cake that is traditionally served for Rosh Hashanah. The recipe I use comes from the Belgian Recipe Page and should be credited to Margaret Buytaert who brought it with her from Kieldrecht, Belgium. There are no tricks here. A child can make this cake. I changed the spicing a bit, replacing the cloves with ginger and adding a 1/4 teaspoon nutmeg and the zest of an orange to the batter. I also found the cake required more time to cook than is stated in the recipe. That may be a vagary of my oven, but I'd suggest you use 40 to 45 minutes as the estimated baking time. My changes to the recipe appear in red. The cake improves with aging, so it's best to bake it a day before you plan to serve it. I'd like to wish all who will be observing Rosh Hashanah this weekend "L'shana tova tikatevu." May your new year be sweet and spent in the company of family and friends. 2) Grease a 9 x 4 -inch loaf pan. Cut a piece of wax paper or parchment to fit bottom of pan. Lightly grease paper. Set aside. 3) Mix dry ingredients (flour, sugar, baking soda, cinnamon, ginger, nutmeg, orange zest and salt) in a bowl to combine. 4) In a separate bowl, quickly mix honey, coffee, egg and oil. 5) Quickly fold in dry ingredients - mixing just enough to combine without toughening cake batter. 6) Fold into pan and bake for 30 minutes (my cake took 45 minutes to bake). Use a tooth pick to see if center is done. 7) Cool on wire rack for 10 minutes. Invert pan and turn cake onto a serving plate. Remove paper. Serve warm with butter, thinly sliced. Yield: 10 to 12 servings. Yummy! It looks wonderful! Thanks for stopping by my blog, I enjoyed having you over and please come back again. Have a wonderful week! I love European cakes like this -- I'll have to try it -- nice for afternoon coffee or tea. This cake sounds interesting with the coffee and honey..and I love your addition of spices. I've bookmarked it! What a great bread, I have never seen a Belgian Coffee Cake but would love to try. Looks delicious. Hello Mary, your post about the cake makes me want a piece. I am building quite a few recipes that you have shared. I even bought a new recipe box to file them. I am really enjoying your post Mary. The holidays coming will be my time to start making these gems. oh this looks yummy! I have not ever eaten coffee cake...I might need to try this one! The texture is really nice and moist. Love it! Finally, I got to see Mary on the screen..he he! And also your lovely daughters. I LOVE this with all its wonderful spices. When I make this, I'm going to use the cloves' I'm just crazy like that, grins. What a wonderful combination of flavors in this cake! I know I will like this European style cake and I'm sure it keeps well. As always, Mary, thanks for a good recipe and a nice story. oh WOW ... this looks delicious! perhaps one of the yummiest sounding bread/cakes i have seen from you yet. the flavors seem like they would be outstanding together! i am scrapping my baking plan for this weekend, and going with this! i will let ya know how it turns out! Yum! It looks so moist and delicious, I love the color and flavors. that looks delicious. great combo of flavors! Sounds and looks like a delicious cake. This would be just perfect with coffee....anytime! Looks like heaven in a little loaf!! I will try it! Strolling through your posts I see many things that catch my eye! Flower, I just wanted to welcome you to One Perfect Bite. I hope you'll come often. Mmmm, I can almost smell it baking from here. I love the coffee and honey combo and would definitely enjoy a slice. Such a beautiful loaf of bread! Your pics are always so perfect! This cake sounds wonderful. I might make smaller loaves and give them as holiday gifts. As usual your recipes and photographs are exquisite. When I saw the title I thought oh I love coffee cake...and I do but this is real COFFEE cake...with coffee in it. Oh dear I am going to have to give this one a try. this looks perfect,dense and tasty! thanks mary! Yum! I might have to give this a whirl. Thanks for visiting my blog and your kind comments. I would just love this bread. I bet my parents would enjoy it as well. Very nice addition to a brunch. I'm Belgian too and I never heard from this kind of cake. In each case not in this form. The name I presume is phonetic but I can not make out what the POM should be meaning. The recipes of the group that provide the Pom Koec is below. They are trying to retain old Belgian recipes in the United States. Perhaps they could answer your question. There are contacts you could reach.